Twenty-nine percent of Americans say that teeth are the first thing they notice about someone. And 57 percent say that a healthy smile is the physical feature they would most like to have. Despite this, as many as a third of US adults fail to see the dentist every year. You may dismiss blood on your toothbrush as a sign that you’re brushing too hard. But bleeding, sore or rotting gums can be indicators of gingivitis, an early stage of gum disease. If your gums bleed often, or enough to cause concern, don’t hesitate in making an appointment with your dentist. Although gingivitis is reversible, it can lead to a far more serious gum disease called periodontitis. This can then result in tooth loss if left untreated. If you are showing signs of gingivitis, regular brushing, flossing and keeping up with dentist visits can help stop the disease progressing. It might seem obvious that tooth pain could be a sign that there’s something wrong with your teeth. But all too often, toothache is one of those dentist signs that people often ignore or dismiss. If you’re suffering from severe tooth pain or throbbing that won’t go away, you should make an appointment to see your dentist. This persistent pain could be a sign of trapped food particles, tooth grinding, an infection, gingivitis, a damaged filling, or an abscess. Only your dentist will be able to determine which of these many causes could be the reason you’re in pain. They’ll also be able to treat the underlying issue and help you to avoid the problem getting worse. A well-lubricated mouth is a healthy mouth. Saliva is responsible for washing away food debris and helping to neutralize plaque acids in the mouth, making it your mouth’s first defense against tooth decay. If your mouth feels dry, not only could this be a sign of a medical disorder, but it’s also compromising the health of your teeth. Another possibility is that your dry mouth is a side effect of a medication you’re taking. If your mouth often feels dry, this is something you should discuss with your dentist. They’ll be able to determine the cause of your dry mouth and recommend ways to restore moisture. Delayed loss of baby teeth is one of the serious dental complications that pediatric dentists are specially trained to look out for, as you can read more about here. But adult teeth are meant to last a lifetime. If you notice any movement, widening gaps, loose, or missing teeth, it’s vital to see your dentist as soon as possible. These issues could indicate infection or advanced gum disease. Tooth loss can also be an early sign of osteoporosis, which weakens your bones and causes a loss in bone density. Tooth loss is particularly common in seniors as they are more at risk of osteoporosis. Around 10 million Americans have osteoporosis, but the disease often goes unnoticed until you break or fracture a bone. As such, your dentist can help you get an early diagnosis, allowing you to seek treatment before you suffer from any serious injuries. Bad breath, also known as halitosis, may be the result of dry mouth, your diet, poor dental hygiene, smoking, or an early sign of gum disease. To avoid bad breath and prevent gum disease, you should brush twice a day, floss daily and brush your tongue too. But bad breath can also be a sign of an underlying health issue that has nothing to do with dental disease or oral hygiene problems. These issues can include gastrointestinal problems, diabetes, or kidney disease. If you’re concerned with persistent bad breath despite a good oral hygiene routine, see your dentist so that they can determine the cause and help you find a solution. Mouth sores that don’t go away within a week or so should be a cause for concern. Sores can be a sign of a bacterial irritation caused by braces, a filling or dentures, a viral or fungal infection, or an underlying medical disorder. It’s also possible that mouth sores could be a sign of oral cancer. Oral cancer is one of the most common forms of cancer in the US and often starts as a small sore or spot in the mouth. If you notice persistent mouth sores, see your dentist as soon as possible. This way, if it is something more serious, they can refer you to the appropriate specialist for immediate treatment. Pain focused around the jaw area or a clicking jaw are difficult to diagnose as they can be the result of many different issues. Possible causes include toothache, grinding the back of the teeth, arthritis, sinus problems, earache, or a TMJ disorder. Your first step should be to see your dentist for a thorough examination, which may include X-rays. They will then be able to determine the possible cause of your jaw pain and make a referral if necessary. Receding gums are quite common, especially for those over 65. Even with good oral hygiene, uncontrollable factors such as aging and genetics can cause gum loss. Although, gum recession can also be a sign of gum disease. But whatever the cause, receding gums expose the delicate roots, causing pain and increasing the risk of decay and infection. 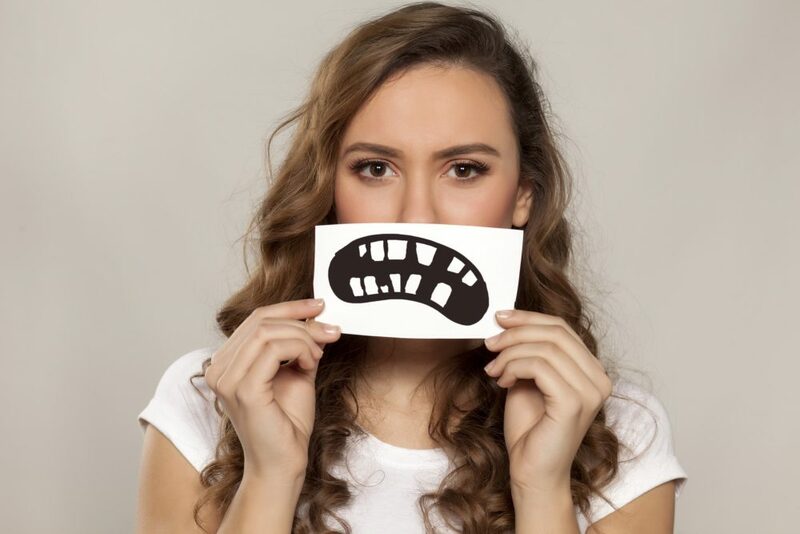 While gum tissue can’t grow back, you should discuss gum recession with your dentist to find out more about treatment options to help stop or slow down the recession process. As these signs of unhealthy teeth show, it may not always be obvious what the cause is or how to address the issue. As such, it’s essential that you see your dentist as soon as you notice any changes, bleeding, pain, or other indicators of an underlying problem. The same goes for other changes in the state of your health, where any warning signs of potential health issues should never be ignored.